This blog post is based on an email conversation with Revd Stephen Williams of Harlington church in England. Might you have a photo (or know where you can take one) I can show my congregation here in UK? It seems to be different from the Sycomore and the Mulberry. What do you think? Fascinating. I’m familiar with the Mulberry tree (Morus Nigra or Alba), in fact, we have one growing in our backyard here in Jerusalem. 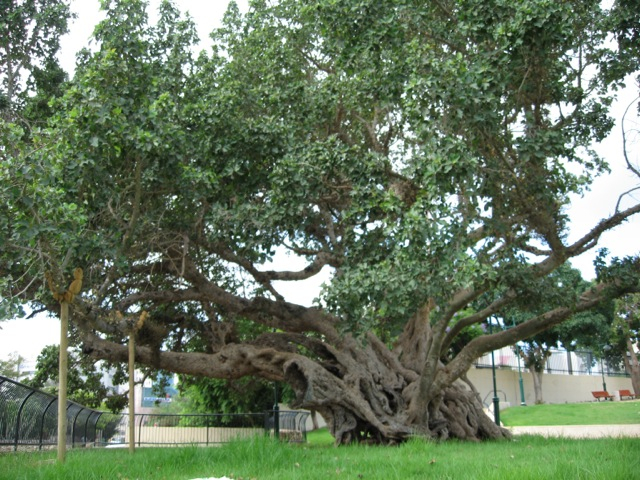 I have photos of a large, old Sycomore tree (Ficus Sycomorus) that I shot in a park at the southern entrance to Netanya. This is the tree described in Luke 19:4, συκομορέαν (sukomoraya) which is translated as sycamore-fig and this seems to be the tree that Zacchaeus, the tax collector climbs into. 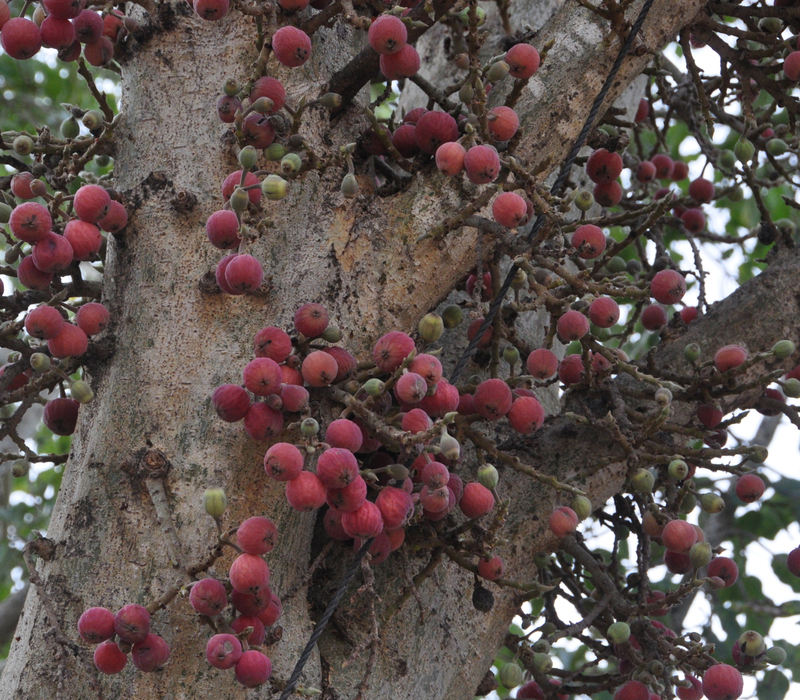 Here is a closeup shot showing the fruit. Your question intrigued me so I contacted the Jerusalem Botanical Garden and their head scientist, Dr. Ori Fragman-Sapir. He replied that he is not familiar with a sycamine tree – we don’t know what tree Luke was referring to. Circa 1350, from Old French sicamor, from Latin sycomorus, from Ancient Greek συκόμορος (sukomoros, “fig-mulberry”), from σῦκον (sukon, “fig”) + μόρον (moron, “mulberry”). Possibly influenced by Hebrew שִׁקמָה (shiqmah, “mulberry”). I think the translation above that shiqmah is mulberry is a mistake. The translation of shiqmah is sycamore(-fig), mulberry is tut in Hebrew. 1. a type of fig, Ficus sycomorus, native to the Middle East; the sycamore tree of the Bible. Sycomore is an obsolete spelling of sycamore that hearkens closer to the word’s Greek roots. Some writers have used the more Hellenic sycomore when referring to the Biblical tree to distinguish it from other trees now called sycamore. The Ficus sycomorus, the mulberry (Morus nigra and alba) and the fig (Ficus carica) are related, they belong to the same family Moraceae. Psa 78:47 He destroyed their vines with hail, and their sycamore-fig trees with driving rain. Amo 7:14 Amos replied to Amaziah, “I was not a prophet by profession. No, I was a herdsman who also took care of sycamore fig trees. 1Ch 27:28 Baal-Hanan the Gederite was in charge of the olive and sycamore trees in the lowlands; Joash was in charge of the storehouses of olive oil. You are a star. You have addressed the problem better than I could have hoped, thinking in the same analytical way I like. And the advice of Dr. Ori Fragman-Sapir is an added bonus, naturally. Thank you so much. As you may have spotted in your searching, there is very little objective addressing of the problem out there – all the writers seem to have fudged it somewhat. But you have clarified a lot. I shall read sycaminos as fig-related, just as sycomorus is, and maybe even the same tree – though I see in Strong’s Concordance that the classical writers knew both words – Luke wasn’t just making the word up, clearly! The tree in the park is perfect for imagining such a tree being picked up and relocated in the sea. One of the gorgeous hyperbole Jesus seemed to love perhaps? The other interpretation is that he chose this tree as an illustration not because of its size but because of the bitterness of the fruit, which I wasn’t so convinced by, hence why nailing it down botanically is crucial. You are right, in Luke 19:4 it’s συκομορέαν (sukomoraya) which is translated as sycamore-fig (that’s the photo I emailed you). But in Luke 17:6 the Greek is συκαμίνῳ (sukamino) which Strong defines as “sycamine tree, having the form and foliage of the mulberry, but fruit resembling the fig”. I checked Avi Shmida’s guide book of Trees of Israel and he mentions a tree, Ficus pseudo-sycomorus which has the leaves of a mulberry and fig-like fruit – this seems to be a better candidate for sycamine. I did find two images at http://www.wildflowers.co.il/english/plant.asp?ID=2354. I will keep my eyes out for a pseudo-sycomorus which according to Shmida grows near Eilat. Whatever the tree, to taste whether the fruit is bitter you will have to make the trip to Israel. Since you are interested in trees and plants of the Bible I mention the five fruit trees that are listed in the Bible as native to the land of Israel: grape and pomegranate – these ripen by late summer and early fall, there is freshly squeezed pomegranate juice available in the markets and various pomegranate wines; figs – are growing wild in the hills of Jerusalem and you can pick them right off the tree; olive – there are some venerable, old trees I can show you in the Garden of Gethsemane and majestic date palms in the Jordan valley. You can also taste the fruit of the carob tree (St. John’s bread), the almond and pistachio (see Genesis 43:11, where Jacob tells his sons to take of the best products of the land to Egypt) and the Jujube tree perhaps from which the crown of thorns was fashioned (ziziphus spinachristi). And that concludes my brief treatise of trees in the Bible but you have to come and see for yourself. I updated Dr. Fragman-Sapir about my conclusion and received this email in response. Ficus palmata is the new and correct name for Ficus pseudo-sycomorus, so it is the same plant. There is a column, Plant of the Month on their website with an article about Ficus Palmata that is an interesting read. This entry was posted in Nature and tagged Bible plants, Ficus, seven species, Trees in Bible, Zacchaeus on September 11, 2012 by Shmuel Browns. On the main highway <1> between Jerusalem and Jericho is a site identified with the Inn of the Good Samaritan (mentioned in the parable in Luke 10:25-37). Remains from the first century BCE to the first century CE were found throughout the area. Abundant finds from this period include pottery, clay lamps, glass vessels, metal implements and numerous coins attesting to intensive activity that befits an inn for Jewish and then Christian pilgrims and travelers making their way between Galilee and Jerusalem. 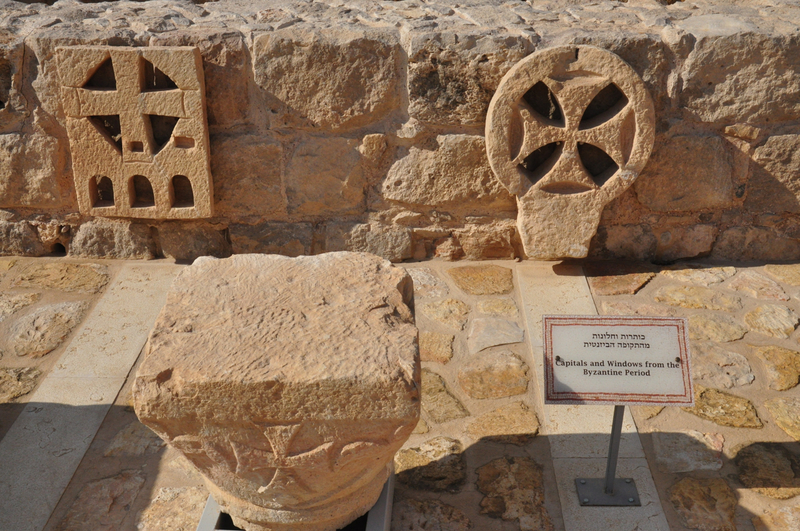 In the Ottoman period, a rectangular structure was built over the southern wall of the Crusader fortress. This building underwent numerous alterations and was restored after being damaged during WWI. It served as a roadside inn guarding the Jerusalem-Jericho road from attacks by brigands as it had for centuries. 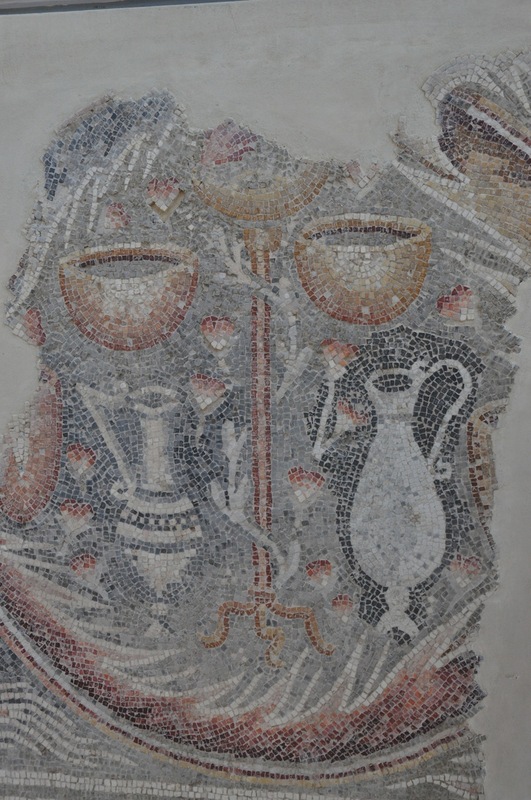 Since the parable of the good Samaritan includes men of three faiths, the newly opened museum has chosen to display the mosaic floors and other artifacts found in churches and Jewish and Samaritan synagogues in Judea, Samaria and Gaza. It is fascinating to see the similarities and differences among the images displayed in mosaic. 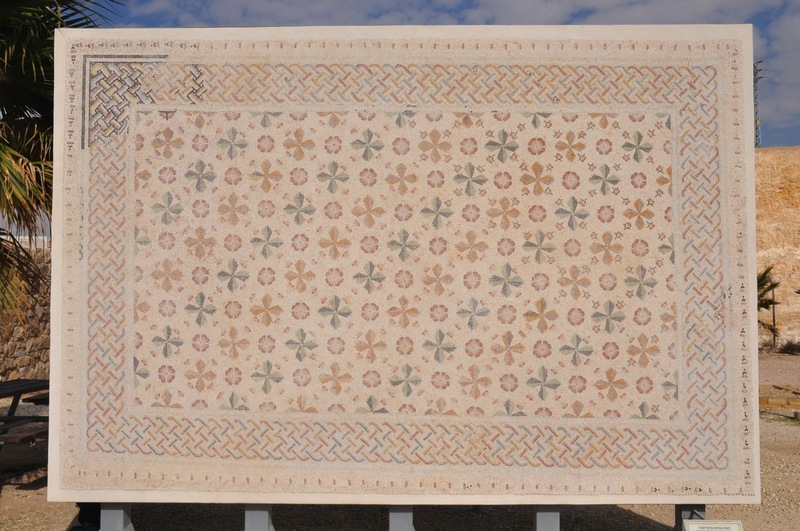 The art of mosaic began in the Greek world around the 4th C BCE and reached Israel during the Hellenistic period. It continued to develop and by the end of the Second Temple and Roman periods simple, plain and geometric mosaics became more ornate, complex with representations of flora and fauna, people, instruments, religious symbols. It became the chief means of paving public buildings, private homes, bath houses, churches and synagogues. Take the cutoff to Maale Adumim to visit the Martyrius monastery (there is a combined entrance ticket; note you need to phone in advance), the largest in the Judean desert. Inside the complex the main church was paved with colorful mosaics in geometric patterns interspersed with pictures of animals; the refectory floor, discovered intact, is covered with mosaics in geometrical designs and the kitchen was also paved with mosaics. On the opposite side of the road along Wadi Qelt visit one of Herod’s fortresses, named after his mother, Cypros. 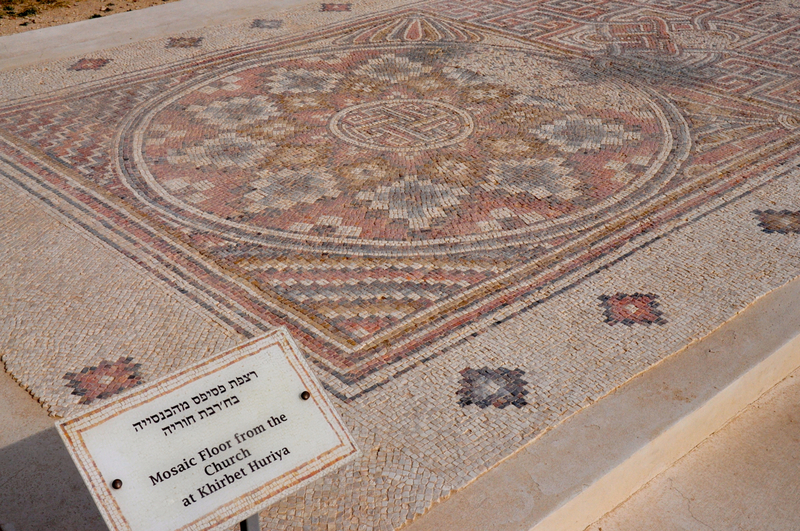 There are 2 bath houses with remains of mosaic floors. 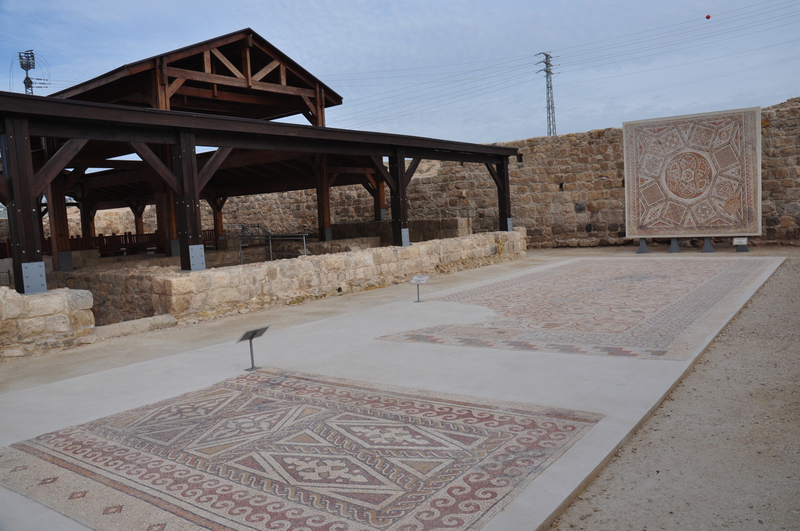 If you are planning a trip down to the Dead Sea and Ein Gedi don’t forget to take a few minutes to check out the mosaic floor in the synagogue (your entrance ticket to the nature reserve is good for the antiquities park). The synagogue has a detailed 18 line inscription in Hebrew and Aramaic including the 12 signs of the zodiac (indicated by their names but not depicted graphically as in most other synagogues of the same period, eg. Tiberia, Bet Alfa, Tzippori). The central hall has 4 birds within a medallion, peacocks grasping a bunch of grapes, a menora and geometric patterns. 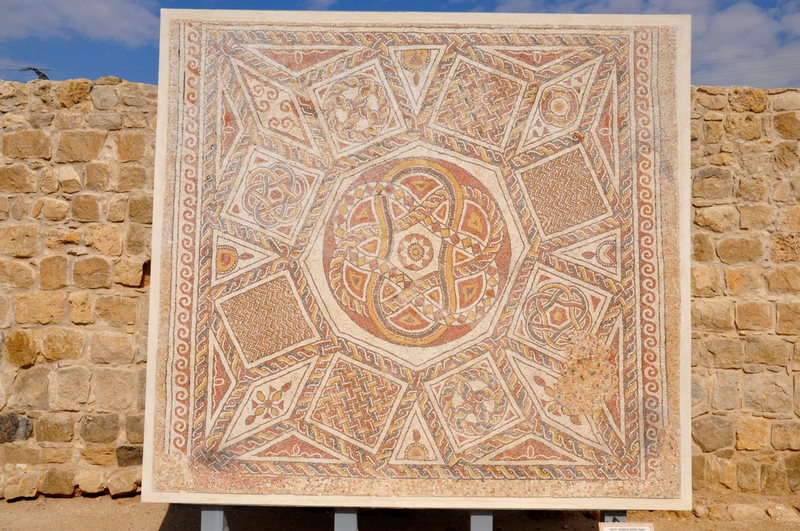 This entry was posted in Archaeology, Mosaics and tagged animals, Christian, church, fruit, geometric, Jewish, mosaic, mosaic floor, postaweek2011, Samaritan, seven species, synagogue on January 11, 2010 by Shmuel Browns.